It’s hard to believe it has been 2 years since my last post, but having a child certainly takes up a huge amount of your time. 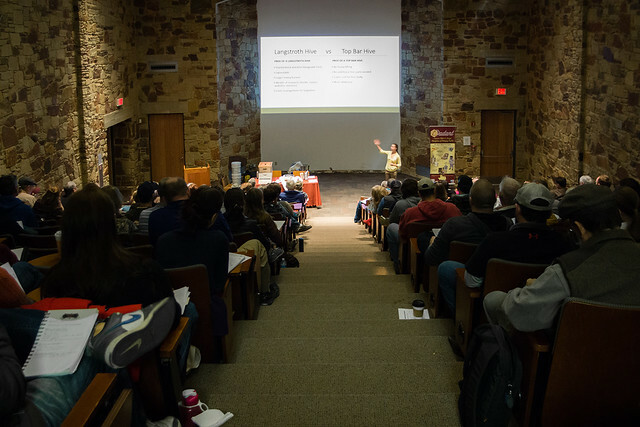 While I haven’t been posting, I am still very active in the Austin beekeeping community and we have our 6th Annual Beekeeping Seminar approaching in January. concurrently in each time slot throughout the day. This will provide many beginning and advanced subjects to choose from. A separate beginner track has been formatted covering a variety of startup topics for soon to be or very new beekeepers. 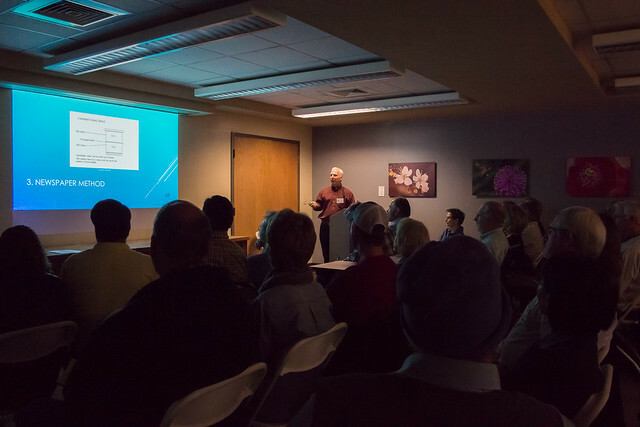 • Mark Hedley- Vice President Texas Beekeepers Assoc. 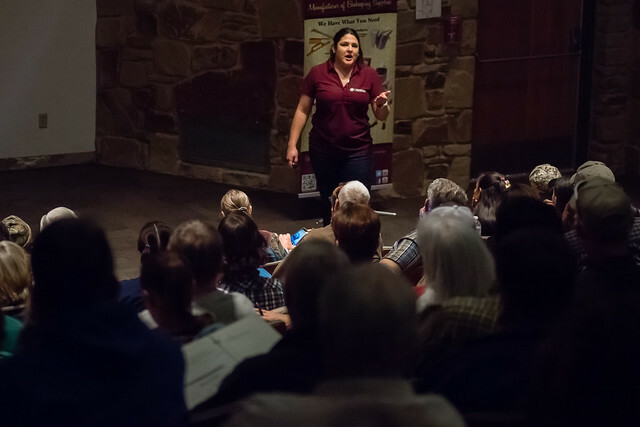 • Cameron Crane-Area Director Texas Beekeepers Assoc. • James and Chari Elam-Owners of Bluebonnet Beekeeping Supplies. • Joe Bader- President of the Fredericksburg Beekeepers Assoc. • Dennis Herbert-President of the Bell-Coryell Beekeepers Assoc. Flat Stanley arrived courtesy of my niece Riya shortly after the holidays. Part of the instructions suggested “dressing” him to reflect either the season we were in or an activity he performed. 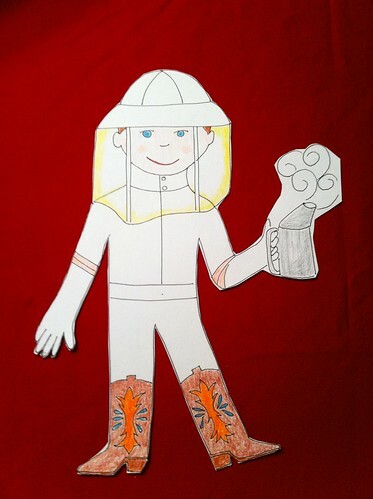 We took these instructions to heart and got Flat Stanley all suited up and ready to do a hive inspection complete with cowboy boots since we are in Texas after all. We had a nice break from the cold weather this past week. It was perfect for a quick peek into the hive I requeened with the Hawaiian queen at the end of October 2012. The hope was the hive was still full of bees with plenty of honey to make it through spring. It would also be a plus if they didn’t try and kill me. To calm the bees before the inspection, Flat Stanley first smoked the hive. After smoking, we opened up the hive and started inspecting frames in the top most super. All 8 frames were all mostly drawn out combs of honey. The next two supers after that were still all honey as well. The bees were also calm and only started getting a little annoyed towards the very end of the inspection. I didn’t go any further into hive because it was late in the day and the temps were starting to go down. If we have another warm weekend this week, I’ll do another inspection and go straight to the 2nd super now that I know the top three are all honey. I’ll hopefully see some activity of brood meaning the queen from Hawaii was accepted. 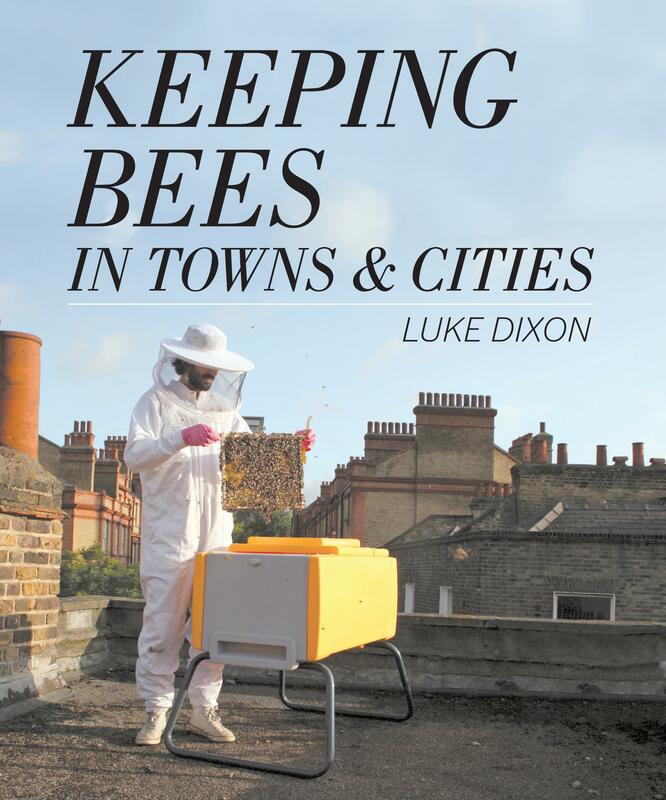 Luke Dixon is a London beekeeper whose new book Keeping Bees in Towns and Cities was just published. In addition to giving the basics on starting a hive, he talked to 23 other beekeepers around the world about their experiences and added it to his book. I was one of the lucky ones he picked so if you buy a copy or see it in your local book store, open it up to page 148 to see my smiling face. I guess now I can just sit back and wait for the movie offers to come rolling in. After my wife watched me go from an obscure beekeeping blog to an international success (seriously, I had three views from Indonesia this week), she obviously wanted in on this blogging action. 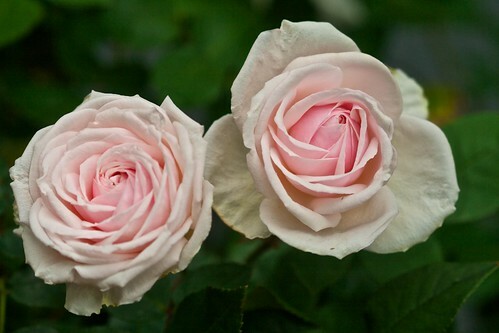 She has now started her own blog titled Game of Thorns where she chronicles her love of gardening with a special emphasis on antique roses. 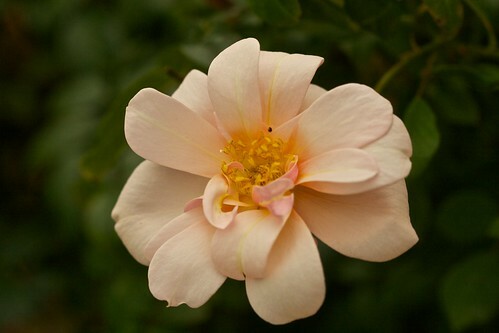 Her latest post made it easy to use in this shameless plug as it relates to native bees using our roses for their nesting materials. After the rains, the roses in the garden are blooming in a rainbow of colors. Souvenir de la Malmaison is blushing pink. 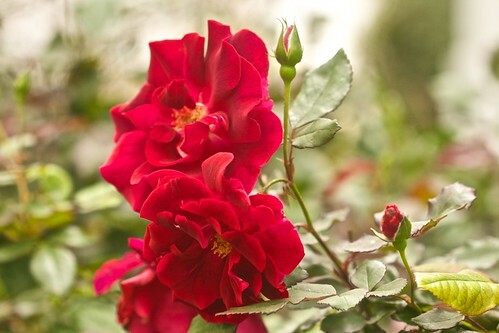 Valentine unfurled its velvety red petals. Perle D’or is living up to its fancy French name. I’m not the only one who has noticed the roses. 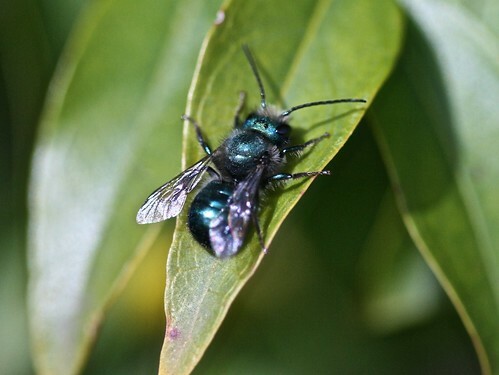 For the past week I have seen these shiny, dark blue-green insects hovering frantically over the rose bushes. Here is the clearest picture of one I could get. Now I would say that I have an above-average experience with insects, but I couldn’t nail down a positive ID on this one. That was when I noted some peculiar things about the mystery bug. First, it kept flying under our outdoor teakwood table. 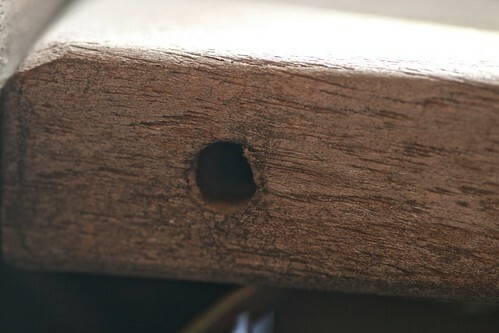 Karl, being adventurous, crawled underneath and saw these man-made holes on the underside of the table that the creatures found delightful to hide away in. Last evening, I got to participate in a review of a section of the City of Austin’s Beekeeping Ordinance. A resolution was passed last November basically stating Austin wanted to be more bee-friendly and prioritize removal and relocation of bees whenever possible over extermination. (C) a colony residing in an abandoned standard or man-made hive. Wherever reasonably possible, the City shall prioritize the removal and relocation of wild or abandoned bees over destruction. It is not a large change, but at least Austin is attempting to update their codes in the recognition of the plight bees are facing in this day and age. Perhaps the best change, in my opinion, is updating the contact list 311 uses when people call in with bee swarms or wild hives on their property. The list currently has extermination services first with bee removal services near the bottom. The new updated list will have removal services first with those that only provide extermination services at the bottom. Priority on the list will also be given to beekeepers and services that will come get swarms free of charge. The hope is to encourage people to use relocation services as opposed to killing the bees. One of the local news stations was out covering the story that you can watch by clicking the link below. 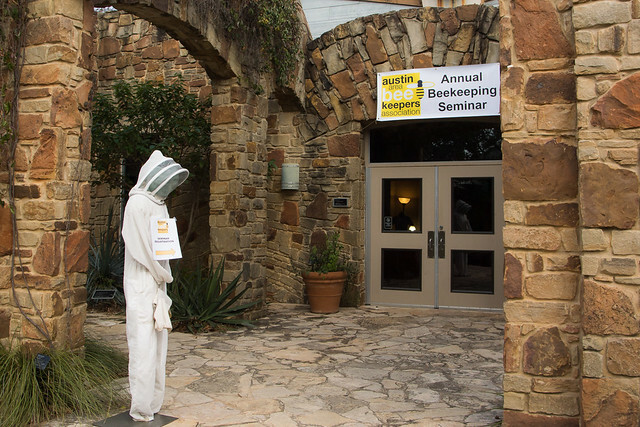 KEYE TV :: News – Top Stories – Participants abuzz at meeting to decide how Austin can be bee friendly.